It seems like just yesterday that we were celebrating the end of the school year, putting the backpacks in storage, and deleting the 6:30 a.m. alarm off our phones. But alas, the start of the school year is just around the corner and we must savor these last few days of summer and all its glory. 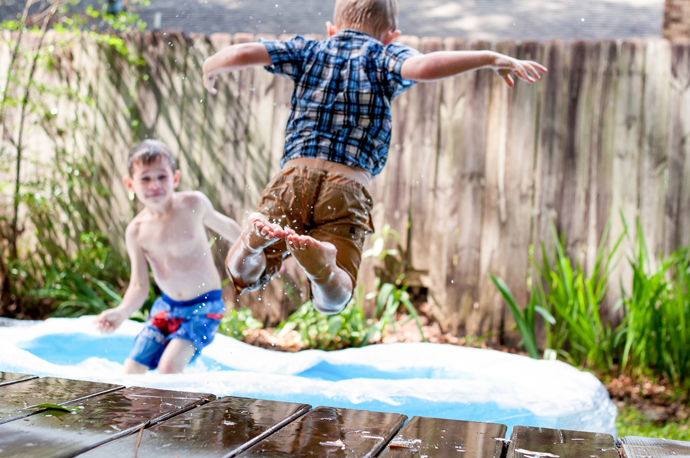 If you’re stumped on ways to help your kids enjoy the last few moments of summertime freedom, consult our list to help them maximize these final days. We included activities from all over Toledo and its surrounding communities, so you are sure to find one located near you! Fossil Park in Sylvania is one of only two prime Devonian Era sites on the planet, filled with world-renowned fossils in a 5-acre quarry. Bring your own paint brush and bag to dust off and transport any fossils you find that you want to bring home! The kids will love discovering ancient relics dating back nearly 375 years, including fossilized brachiopods, coral, and more than 200 species of prehistoric life. Warm the kids up to the idea of learning before they return to school with this fun and interactive educational experience. If you have younger kids in your crew, a visit to the Fort Imagination playground at Woodlands Park in Perrysburg is the perfect way to let them get all of their energy out and enjoy the sunshine. This community-built play structure has been a popular destination for families since its inception in 2008. The rest of the park is worth exploring as a family, as it includes large grass areas, beautiful gardens, an 18-hole disc golf course, and several picnic tables and shelters. During these final hot summer days, a trip to the pool seems like the perfect way to cool off. If you don’t have a pool in your own backyard, don’t fret! There are several pools in the Toledo area that provide an escape from the strong late-summer sun. Make the trek to Port Clinton for an action-packed water adventure to top off the summer at Monsoon Lagoon Water Park. This indoor/outdoor family fun center holds water slides, a go-kart track, an arcade and a mini-golf course. Cool off and have a blast on any of the water-related attractions, including Typhoon Rush, Coral Reef, Adventure Island Treehouse, and Pirate Cove! Tickets range in activity options and prices, but you can purchase a pass to the waterpark for $20. If you’d rather stay dry during your visit, be sure to stop by their brand new walk-through safari zoo addition, featuring giraffes, kangaroos, and many more exotic animals! We talk about Sundance Kid Drive-In quite often, but it would make the perfect bookend to another successful summer in the books! Head to this nostalgic ‘50s-style drive-in located across from Pearson Park in Oregon for two features back to back. What’s even better is the ticket pricing for this out-of-the-box moviegoing experience; pay just $9 for an adult ticket, $3 for children ages 5–12, and $0 for children under 4. The next time your kids will see an elephant is in their science books once school is back in session. Before that day arrives, give them an in-person and larger-than-life learning experience with a visit to the Toledo Zoo & Aquarium during their final days of summer vacation. Slap on the sunscreen and pack lots of water to stay cool as you walk around looking at the incredible exhibits! Head about 20 minutes north of Toledo to escape the busyness of downtown, with a peaceful farm experience at Erie Orchards and Cider Mill in Erie, Michigan. This gorgeous farm holds approximately 70 acres in production, including about 15,000 bushels of apples that are harvested annually off 30 acres of apple trees. Pick your own apples, peaches, blueberries and pumpkins, depending on the time of the year and the corresponding harvestings seasons. Erie Orchards and Cider Mill is open Monday through Saturday from 9 a.m. to 7 p.m. and Sunday from 11 a.m. to 6 p.m.
You simply haven’t had a complete summer until you’ve taken the whole family to Cedar Point in Sandusky. This nearby amusement park is considered the Roller Coaster Capital of the World, featuring an overwhelming number of roller coasters that the thrill-seekers in your family will love. During a hot summer afternoon, you may be particularly interested in their refreshing and riveting water rides! End your family’s summer with an out-of-this-world experience at Cedar Point. We’re huge fans of the Bedford Township area and all of the fun activities therein, especially the Indian Creek Petting Zoo. Step out of your typical zoo routine with a trip to this petting zoo offering camel rides and up-close viewing of exotic animals, such as zebras, camels, emus, wallabies, donkeys, coatimundi, alligators and peacocks! Take things a step further (and a further drive as well) at the African Safari Wildlife Park in Port Clinton, where you can drive or walk through their safari filled with exotic animals you just don’t see every day. During the drive-thru safari, you’ll get up-close interactions and feeding opportunities with these animals, including alpacas, ankole, bactrian camels, bison, elk, fallow deer, giraffes, llamas, zebras, and more! Take your road trip to Port Clinton up a few notches with these extremely rare animal sightings. Let us know what you’re doing in the area to maximize your days as a family in the sunshine. We’d love to know!